In the Boston suburb of Norwood, MA, there is a commuter rail stop called Windsor Gardens. It’s a pretty unassuming place, a single low platform on a single-track segment of the Franklin Line that sees 13 inbound trains per day. There is one thing that’s unusual about the Windsor Gardens station amidst the MBTA’s constellation of park-and-ride oriented suburban stations: it has no parking. 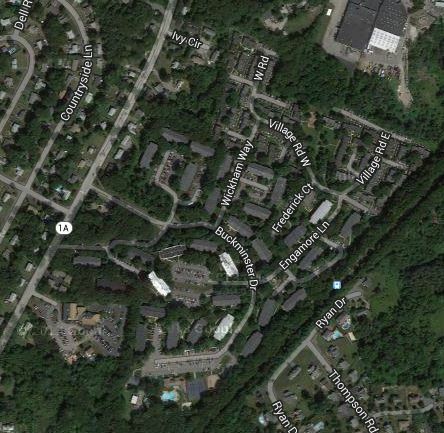 Instead, Windsor Gardens is intended to serve the residents of its namesake apartment community, The Berkshires at Windsor Gardens, a relatively upscale 1960s-era development with prices in the $1,000-$2,000 range. Though I haven’t been able to get an answer from the administrative office about how many people live in Windsor Gardens, the Norwood town history site notes that when opened it had “approximately one thousand units,” and the relevant census block, which includes a few additional houses, listed a population of 2,004 people in 2010. 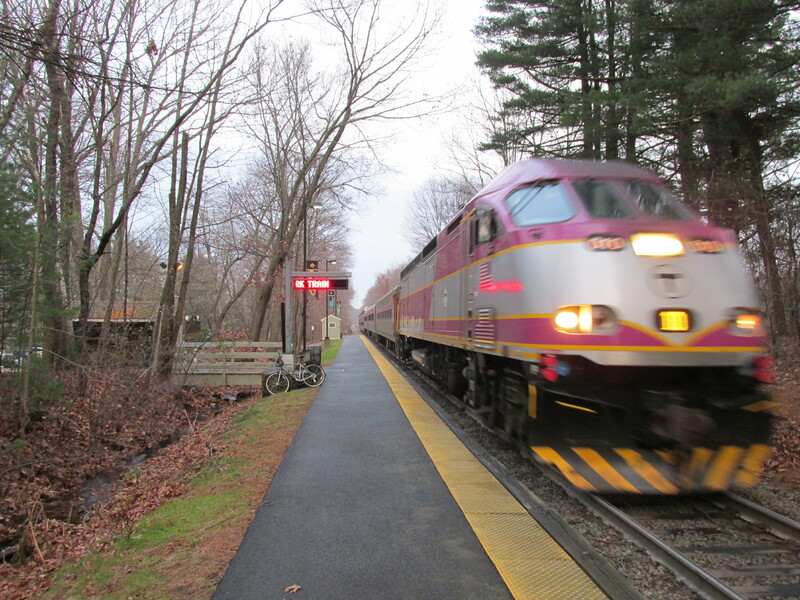 The MBTA commuter rail system has some stunningly low-ridership stops, and one might expect that a station serving a single development, with no parking available for people who don’t live in that development, would be among them. Instead, according to the 2014 MBTA Blue Book (2013 data) Windsor Gardens ridership–inbound only, the way MBTA measures it–was 624 riders per day. 624 isn’t a huge number–the top-performing stations in the MBTA commuter rail system see around 2,000-2,500 inbound boardings per day–but it IS a big number in the context of a station that essentially serves one development and provides no parking for commuters. For the record, there appears to be no (legal, at least) pedestrian access to Windsor Gardens station from the east side of the tracks, and while it’s possible some commuters walk into the station from the subdivisions across Route 1A, that number seems unlikely to be large, and a private apartment community seems unlikely to welcome strangers tromping through it every day. Ridership does appear to be recovering with the economy, and in 2013 it was twice what it was in June of 2007. Even then, a ridership figure of 300 inbound riders per day would have represented approximately 15% of the total number of people who can be assumed to live in Windsor Gardens. If ridership now stands at 624 per day, that would be around 30% of the residents of Windsor Gardens who ride the commuter rail every day–a truly astonishing percentage. And remember, those are numbers of residents, not numbers of workers; the percentage of workers riding transit would be even higher. The typical “rate of return”–how many residents actually ride transit to commute–on transit-oriented development is hard to calculate, but best guesses are that they average around 25%, with TOD around rapid transit skewing much higher, and around commuter rail much lower. With between 15-30% of residents riding transit every day, Windsor Gardens would appear to be an exceptional success by the standards of commuter-rail oriented TOD. It would also appear to be a demonstration of the power of proper land use near transit stations to generate transit ridership–and of the idea that TOD can be built, and still generate significant ridership, without massive amounts of parking. Windsor Gardens as an apartment community isn’t what we’d think of as “true” TOD today; it’s a single-use residential community set in an area that’s not walkable and highly auto-oriented. I assume that virtually everyone who lives there owns at least one car per household, just to get to the grocery store and school. But even a development approaching 50 years old can demonstrate that if you make it convenient enough, you can house suburbanites in a transit-oriented way.